OK, so it was hardly tropical yesterday but the sunshine was out, high up in the sky behind a few pesky clouds. Ever the optimist, this to me reads the snow has disappeared and won’t be returning until December. 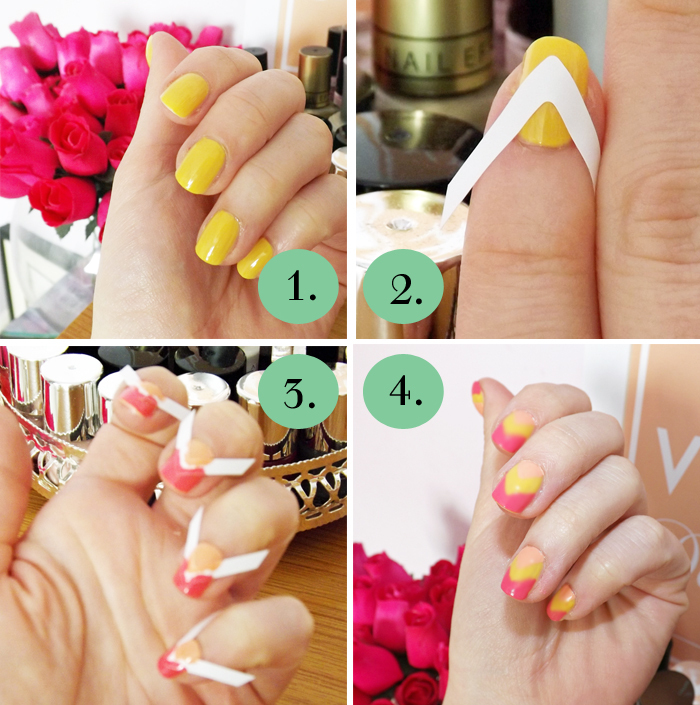 In celebration, I decided to put together this little spring time nail art tutorial. Now, all you nail art buffs, I know this is a pretty basic tutorial but I’m a novice at these things so I’m hoping there are others out there like me who just want to try something different but relatively easy-peasy. 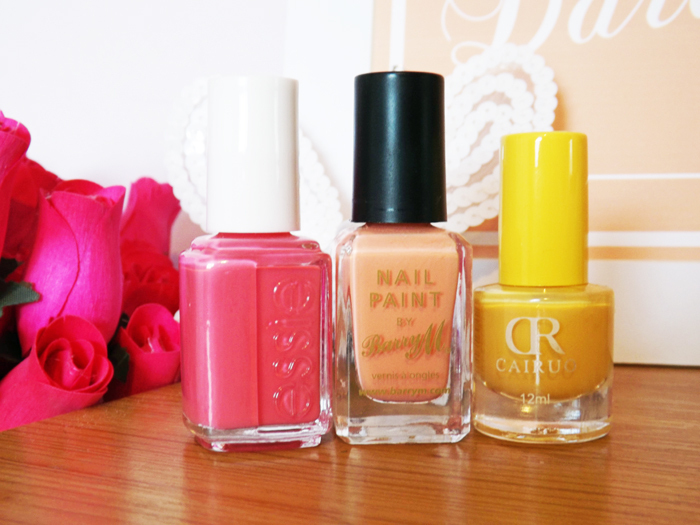 I wanted to team my favourite colours together – pink, coral and yellow – in some way and when I saw this idea in a high fashion publication *cough *cough Avon catalogue, I decided to give is a bash yesterday afternoon in between munching on my lovely Easter egg. 1.OK, so the first step for me was the get my falsies on. If you want to try an easy way of putting false nails on, check out my tutorial here but if not, then just make sure your nails are nice and clean and paint them a base colour. This will be the colour you want the middle V to be, and for me it was this sunshine yellow I picked up yesterday at a cheap shop in Leeds called Xtras for £1. It’s not a colour I’d wear all over so I wasn’t overly bothered about the brand. Paint two layers on and leave to dry for at least 20 minutes (I’d dedicate an hour to this nail art project, but if you don’t have time you can buy instant drying spray to speed the process up. 2. The next step is the place sticky french manicure strip guides which, again, can be bought from the high street store. I bought mine, again, from Xtras. If you’re unfamiliar with this shop, its a cheap store with sells wigs, inexpensive perfume, make-up and fancy dress. It’s not somewhere I buy my every day make-up from but if I need, say, a black lipstick for Halloween, then this is the place I’ll go. The V sticker can be placed facing up or down whichever way you want, but be sure to make sure your nail varnish is dry completely before you move it – I learnt the hard way and took a big chunk of yellow off and had to start all over again on my pinkie. 3. Take your next two colours and paint both the bottom and top, making sure to cover the whole area but trying to not get any under the sticky strip or else the lines won’t be straight. As a complete OCD-er (if that’s a word), the lines have to be straight! Leave for another 15 minutes to dry completely. 4. The final step is to carefully peel back the strips to reveal the yellow line. The lines didn’t turn out as straight as I’d have hoped but I’m hoping my next attempt with be slightly neater. I’ll also be trying some different colour combinations out, maybe a monochrome and silver look? Finish with a top coat and you’re done. This colour pallet goes perfectly with my this gorgeous cameo ring I was kindly gifted recently from an online boutique going by the name of Carnaby and Campbell. 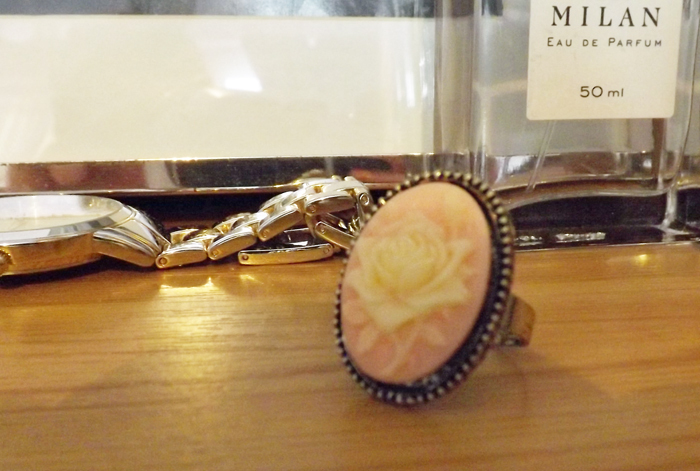 Offering a carefully curated selection of vintage-inspired jewellery, accessories and clothing, this little beauty is only £4. On a final note remember to let me know if you’d like to see anything else from me in terms of beauty, hair, fashion, lifestyle, eating, diet or interiors. I’m always open to new ideas and if it’s a DIY project you’d like to see, it gives me a chance to perhaps get the PVA glue out!